I didn't thrift as long and hard as I did last weekend, but I still came out with some lucky finds! 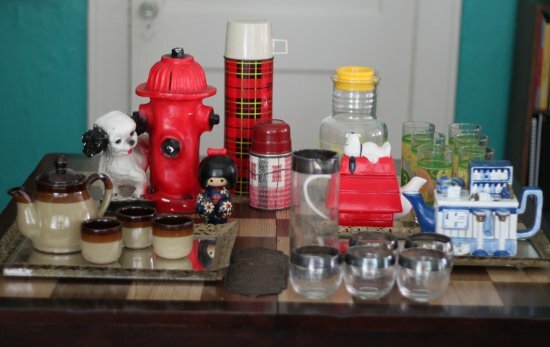 I found teapots, glasses, thermoses, and playful cartoonish kitsch finds for my antique store booth. Is anyone fitting July 4th thrift stores sales into their day today? A couple stores in town are having store wide 50% sales- I'm definitely checking them out before hitting up BBQs and the beach! I found Dorothy Thorpe's "Silver Band" Roly Polys with a cool mod pitcher! If you're interested in this set you can buy it here. The glasses and pitcher were found at separate thrift stores, they're not a set but they look great together. The pryex pitcher was brand new with packaging included. The "set" is perfect for summertime lemonade. I think I'll hold on to these for now. A $1 flea market find. It's damaged and dirty, but there was just something about it. I love the bright colors and I think the distress adds to it. 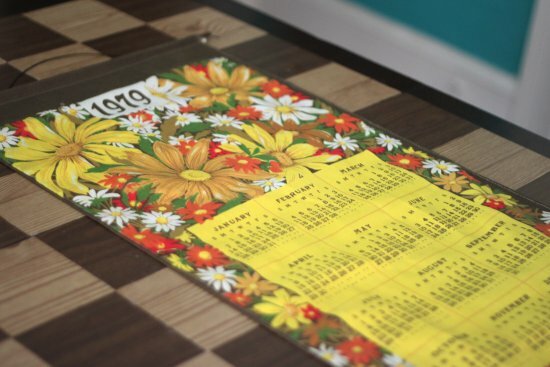 These cool retro calendars seem collectable lately. I scooped up this groovy one for its flower power print. I finally found something that's been on my thrift-list forever, an antique-style full length mirror for my bedroom. This one was $20, the best price I've encountered. They're usually $60 in antique stores and I've never seen one at the thrift. 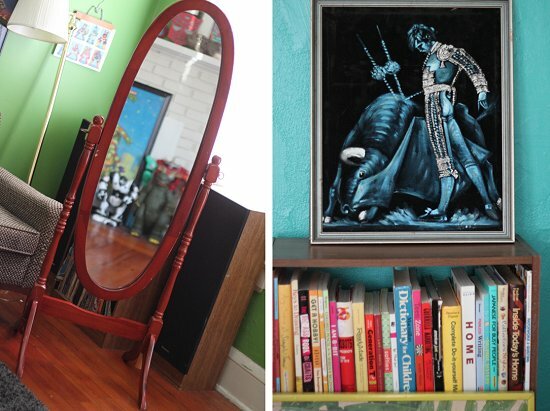 The pretty blue matador painting can be purchased here. It was the second one I saw this weekend, but the second one was too expensive. Anyone else notice funny patterns when they hunt? Giant kitsch bits! The piggie bank is filthy and will require some serious cleaning, but I love the expression. And it's the biggest damn piggie bank I've ever seen. 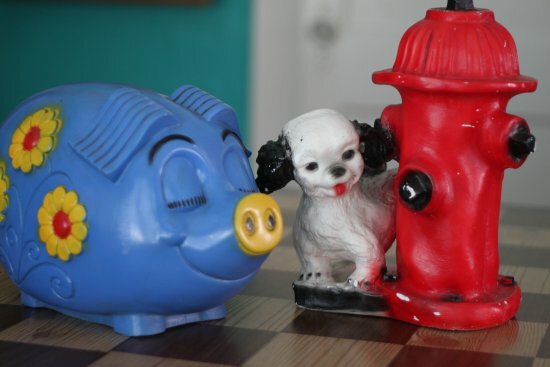 The vintage chalkware dog and fire hydrant bank was a unique piece that was hard to pass up, too. 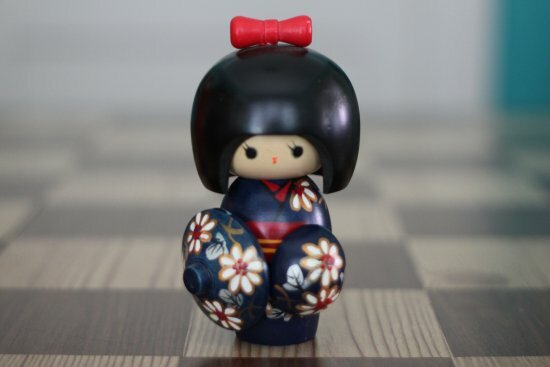 Found in its original Japanese box, I think this is my new favorite kokeshi. I love the hand-painted details, wide eyes, and the cute rosebud lips and eyelashes! 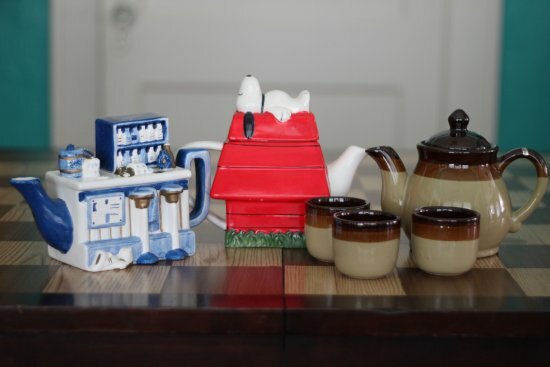 And now for the final pattern of my weekend thrifting adventures...tea pots! I found these three at the same thrift store. A bar, a snoopy on a house, and a groovy brown one. Fun finds! About my Antique Store Booth: I talked with Candace this weekend, and she let me know that local readers have come to the shop looking for my booth. My booth number is #4504, let the owners know and they'll take you right to my lone bookshelf in the clandestine back corner of the store. :) Thank you for checking it out! 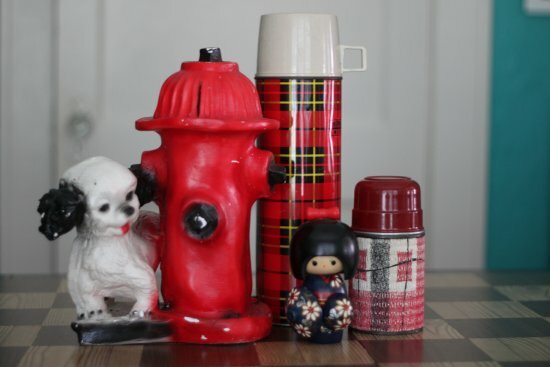 It's For Sale: Yep, most of the stuff you see in these Thrift Haul posts are for sale. If you're interested in an item, let me know in the comments or send me an e-mail. All the thrifts here are closed, mainly because they rely on volunteer staff. Not even garage sales today unless unadvertised. I like the lemonade "set" you put together. 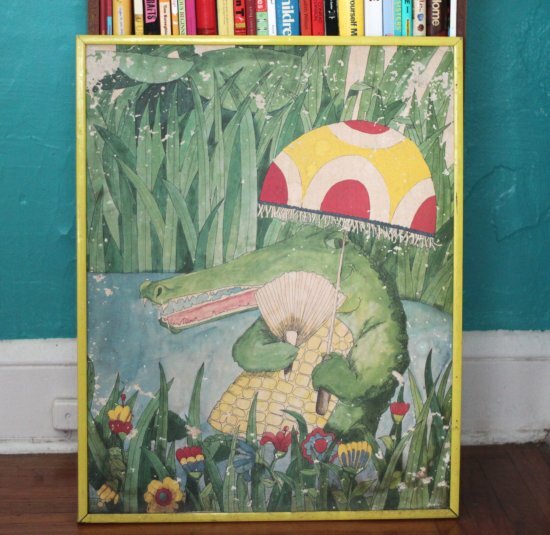 The gator picture reminds me of a 60s children's book illustration, but I can't quite remember. Amazing find on the full length mirror. Can not beat that price. Enjoy your day and have some good food and fun! Dogsmom: I'm surprised that a few here are open and having sales, gonna take advantage! oh, wow. great finds! that mirror is great. i find a lot of those coin banks, but they are usually chipped or the rubber stopper is missing on the bottom. what fun and lovely finds. 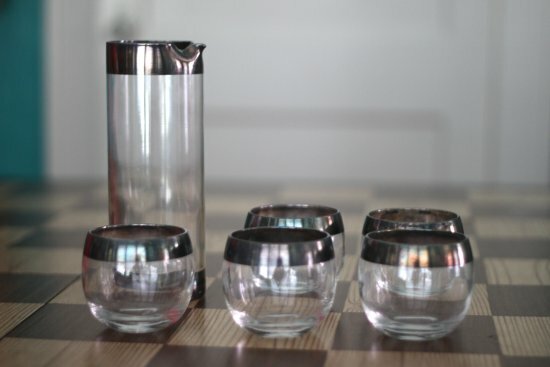 Love the roly poly pitcher set! Nice variety of finds! I agree about the chalkware usually being chipped up, looks like yours are in pretty good shape. Great finds, congrats on ticking the mirror off your thrift list! the mirror and tea pots are great. love the mirror!! A fun haul this week, looks like a former teapot collector donated their goods to the thrift you visited. 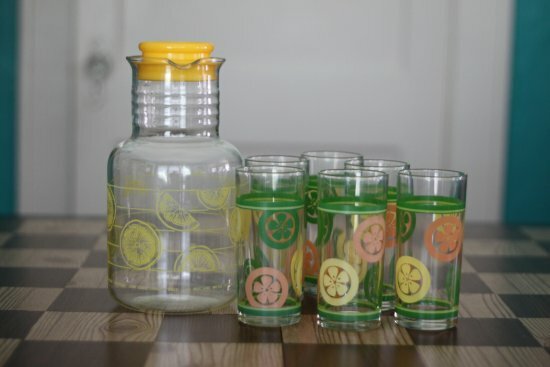 I have a similar Pyrex pitcher (it is perfect for lemonade) and I'm envious of the Dorothy Thorpe set, I always find them in band shape! OK, it is official: I must have a piece of gator-art for my walls. I need something substantial-ish (8x10 - 11X14), and flat, and preferably framed. I love the one in this post. How big is it? By the way, I'm putting you on the gator-art duty because 1) You live in Florida and 2) I live in Death Valley and 3) You are the thrifter. YES! My Mom and I visited the Southern Crossings Mall on Thursday and we asked which one was your booth....I am looking for two letterpress trays but didn't find any. However, I did find a vintage camera and a really pretty silver necklace....it was fun and we will be back soon! Carla: Glad you at least found some bits from other booths. It's hard to leave Southern Crossing without finding something! I totally love the expression on that pigs face too! So fun!